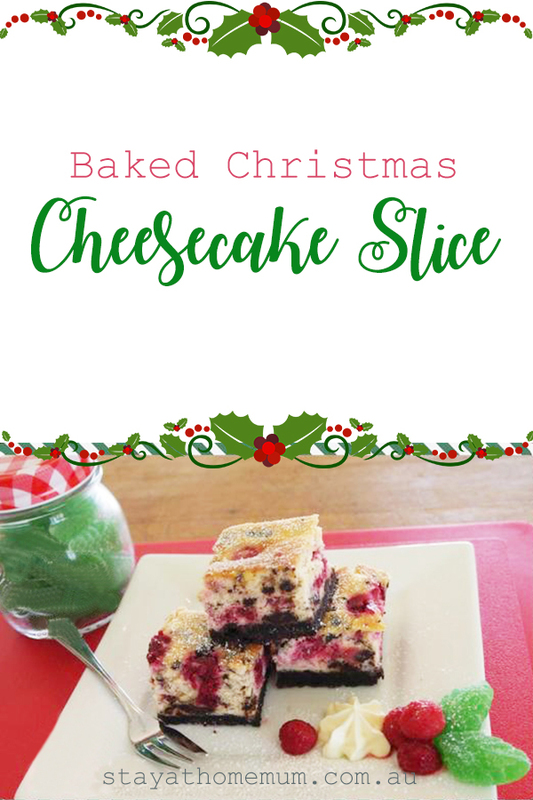 Baked Christmas Cheesecake Slice is a delicious mixture of Raspberry, Chocolate biscuits and Cream Cheese. Line a rectangle slice tin with baking paper. Crush the biscuits and mix in the melted butter. Combine well and then press the mixture over the base of the prepared pan, place in fridge to set. Beat the cream cheese until smooth and then add the sugar. Beat for 3 - 4 minutes or until thickened. Add the eggs 1 at a time and beat until combined. Fold in raspberries and the chocolate. Pour mixture into the pan with the biscuit base. Bake for 40 - 50 minutes or until it is just firm. Cool to room temperature and then cover with plastic wrap and place back in the fridge until it has chilled. Lift out and cut into pieces. Baked Christmas Cheesecake Slice is not suitable for freezing. You can also replace Milk Chocolate with White Chocolate, which will give a delicious flavour.